Yes, it really is all included. Coco Plum offers its guests a truly relaxing vacation of a lifetime. A variety of Belize all inclusive packages are available to suit your needs such as the All Inclusive Package which includes various mainland excursions and the All Inclusive Honeymoon Package complete with romantic flares to celebrate newlywed bliss. We have carefully created these all inclusive packages to provide you with the wonderful dream of vacationing on your own private island combined with the comfort that nearly everything is included in the rates. There is no need to stress about planning activities and excursions, or being surprised with hidden fees when you arrive. Simply sit back, relax, and enjoy the views as our Guest Service team is prepared to exceed expectations. The boutique-size and private locale of our Belize resort allows us to offer personalized service and thoughtful details that are sure to impress. Our little island is nestled approximately nine miles off the coast of a sleepy town 80 miles south of Belize City named Dangriga. Belize City is only a two-hour flight from several major U.S. cities such as Miami, Houston, or Dallas. While international airfare is not included in the package rates, the boat transportation to our private island paradise is included in our Belize all inclusive packages. More info about traveling to Coco Plum Island can be found here. Accommodations in ocean-front A/C cabana with private bath and running hot water. Three Belizean meals and bar snacks daily, including packed lunches when on tours. Unlimited free local beer, soft drinks, and local mixed drinks (mixed drinks made with local gin, local coconut rum, local vodka, and local rum only). *Not included with the Dive package. Round Trip 30 minute boat transfer to/from Coco Plum Island Resort on arrival and departure day. 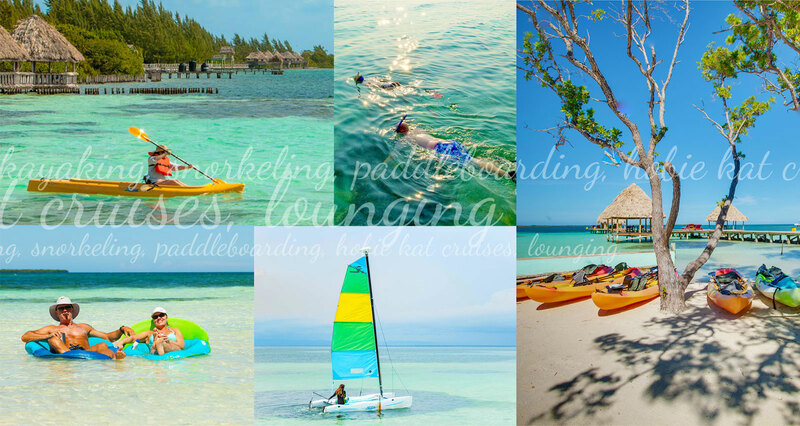 Free use of kayaks, snorkel gear, stand up paddle boards and small Hobie Cat. Click on the package name to see the rates and details for each package. Perks can be added a la carte to any package, contact the Reservation Team for more details. Packages also include daily housekeeping services and all hotel & sales tax. **Arrivals and/or departures scheduled on a day other than Sat or Sun subject to upgrade charge of $50 each way per booking (not per person). Adventure awaits you in Belize. Choose from a variety of scheduled All Inclusive Adventure Tours which are included in several packages such as: the Xunantunich Mayan Ruin tour, Combination Cave Tubing & Zip-lining or Belize Zoo tour, and Southern Barrier Reef Snorkeling tour. Looking to pump up your Belize all inclusive adventure? Then consider our Speciality Tours, which are not a part of our regularly scheduled tours. These tours, which can be added to any package, include scuba diving, fishing, and additional snorkeling tours. "This place is like a little slice of Heaven. It's so beautiful! The staff made our 25th wedding anniversary something special and very memorable...Excellent for romance and total relaxation." "The island has so many things to keep you occupied...there's swimming, sun bathing, bar, snorkeling around the island, kayaking, SUP boarding, ping pong, corn hole, and simply just chilling reading a book." "My wife and I visited Coco Plum Caye and it was all it was advertised as. An island retreat that sparked all your senses and made you want to stay there forever. The staff was as warm and welcoming as anywhere we have ever been. The food was way beyond our expectations and the all-inclusive package is a bargain with all you get." Be the first to hear about our special offers.